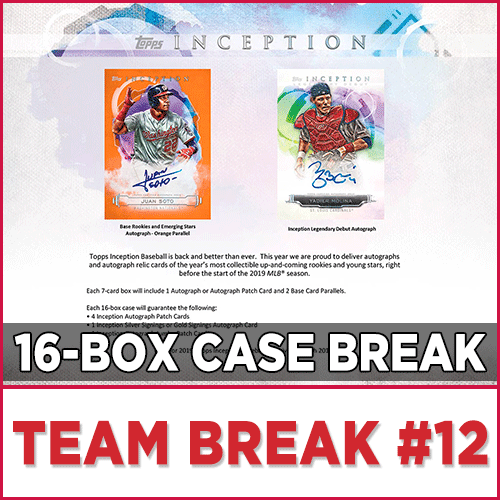 Each Box contains One Autograph or Autograph Patch Card and Two Base Card Parallels! 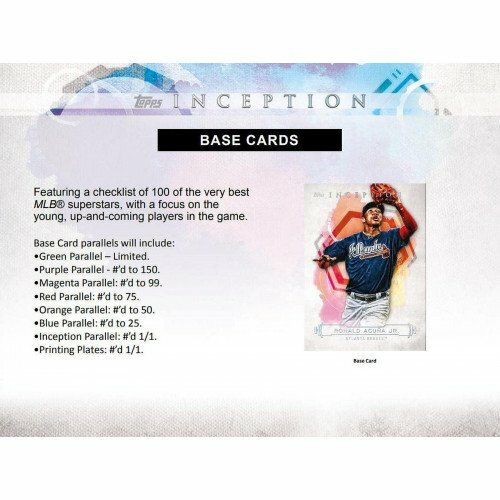 Topps Inception Baseball is back and better than ever. 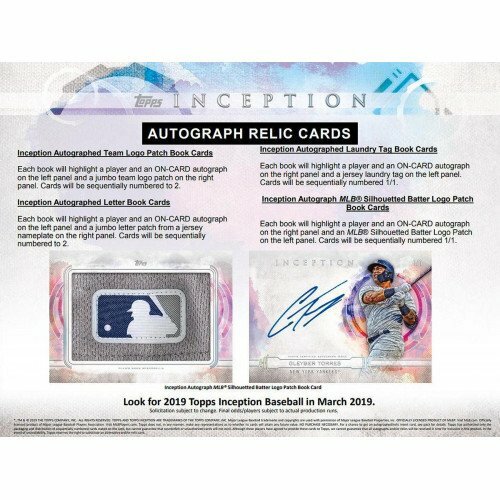 This year we are proud to deliver autographs and autograph relic cards of the year's most collectible up-and-coming rookies and young stars, right before the start of the 2019 MLB season. Featuring a checklist of 100 of the very best MLB superstars, with a focus on the oung, up-and-coming players in the game. - Green Parallel - Limited. - Purple Parallel - #'d to 150. - Magenta Parallel: #'d to 99. - Red Parallel: #'d to 75. - Orange Parallel: #'d to 50. - Blue Parallel: #'d to 25. - Inception Parallel: #'d 1/1. - Printing Plates: #'d 1/1. 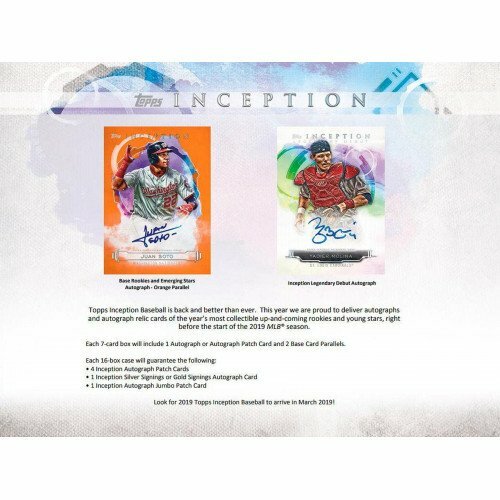 Highlighting ON-CARD autographs of the top 2019 MLB rookies and young stars. Base versions to be sequentially numbered. - Magenta Parallel - #'d to 99. - Red Parallel - #'d to 75. - Orange Parallel - #'d to 50. - Blue Parallel - #'d to 25. - Gold Parallel (Signed in Gold Ink) - #'d to 25. Turn back the clock to when these MLB superstars made their Big League debuts. 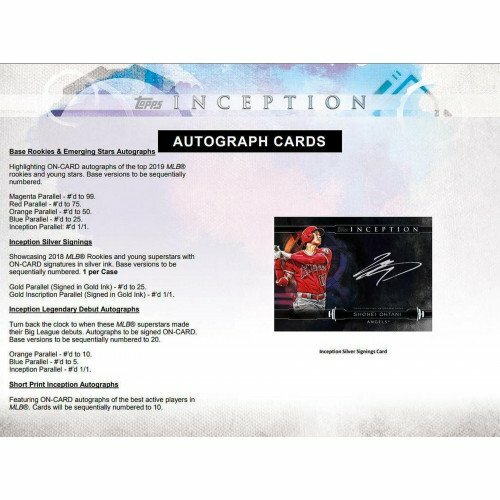 Autographs to be signed ON-CARD. Base versions to be sequentially numbered to 20. - Orange Parallel - #'d to 10. - Blue Parallel - #'d to 5. - Inception Parallel - #'d 1/1. 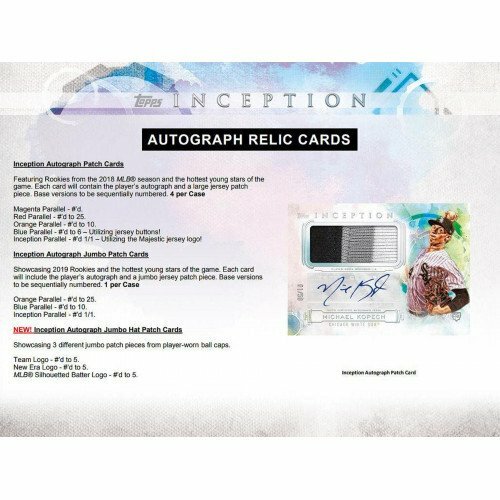 Featuring ON-CARD autographs of the best active players in MLB. Cards will be sequentially numbered to 10. - Magenta Parallel - #'d. - Blue Parallel - #'d to 6 - Utilizing jersey buttons! - Inception Parallel - #'d 1/1 - Utilizing the Majestic jersey logo! - Orange Parallel - #'d to 25. - Blue Parallel - #'d to 10. Showcasing 3 different jumbo patch pieces from player-worn ball caps. - Team Logo - #'d to 5. - New Era Logo - #'d to 5. - MLB Silhouetted Batter Logo - #'d to 5. Each book will highlight a player and an ON-CARD autograph on the left panel and a jumbo team logo patch on the right panel. Cards will be sequentially numbered to 2. Each book will highlight a player and an ON-CARD autograph on the left panel and a jumbo letter patch from a jersey nameplate on the right panel. Cards will be sequentially numbered to 2. Each book will highlight a player and an ON-CARD autograph on the right panel and a jersey laundry tag on the left panel. Cards will be sequentially numbered 1/1. Each book will highlight a player and an ON-CARD autograph on the right panel and an MLB Silhouetted Batter Logo Patch on the left panel. Cards will be sequentially numbered 1/1.